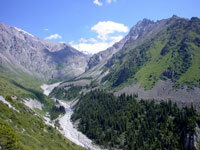 Surrounded by Kyrgyz Ala-Too range, the Kyrgyz Republic in Central Asia is an adventuer's paradise. Containing some of the highest mountains in the world, with 23 peaks over 16,404 feet (5,000m), Kyrgyzstan is often referred to as the 'Switzerland of Central Asia'. The challenge of climbing these remote mountains has long been an irresistible lure for mountaineers, although for most of the 20th century the area was off-limits to foreigners outside of the Soviet Union. Ala-Archa National Park includes 20 glaciers and 50 peaks and offers dozens of horse trekking, hiking, climbing, and skiing possibilities. The mountains are also home to lakes, including Lake Issyk-Kul, which at 113 miles (182km) long and 37 miles (60km) wide is one of the largest alpine lakes in the world; the less touristy Song Kul; and Jeti Oguz, which has some spectacular mountain formations and thermal springs. Another popular attraction in Kyrgyzstan is the walnut forests of Arslanbob. The Kyrgyz, the country's largest ethnic group, are traditionally nomadic herders originating from Siberia in the 13th century. Their nomadic habits continue today as families herd their sheep, yaks, and horses back up to the mountain pastures (jailoo) every summer where they live in round hide tents known as yurts. The tradition of horse riding is part and parcel of the Kyrgyz culture and numerous festivals and games are centred on this activity. Hospitality is another key function of their way of life and visitors will find it difficult to pass by without an invitation to share in a drink of fermented horse milk (kumys), an acquired taste by anybody's standards. We are looking for contributors for our Kyrgyzstan travel guide. If you are a local, a regular traveller to Kyrgyzstan or a travel professional with time to contribute and answer occasional forum questions, please contact us. Intrepid Travel is one of the world's leading suppliers of small group adventures focused on getting off the beaten track and having real life experiences in Kyrgzstan.